T. Rex, the '70's British glam rock band led by the late Marc Bolan, had only one hit single in the U.S. ("Bang A Gong (Get It On)" in 1971), but they were a huge sensation in their native England, almost on a par with the Beatles and the Stones. 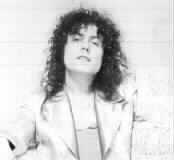 Bolan died in a 1977 car crash, but he and his band are fondly remembered by many. A mind-boggling number of Marc Bolan and T. Rex titles have been released over the last few decades; there have been countless compilations and "alternate versions" of albums (and that's just scratching the surface), but the first five proper albums recorded by Bolan and company are out of print in the U.S. This review page focuses mainly on Bolan's early acoustic recordings, which predate his glam-rock stardom. In the beginning, when T. Rex was formed in 1967, they were merely a duo comprised of Bolan and Steve Peregrine Took (who took his name from J.R.R. Tolkien's Lord Of The Rings). They played all-acoustic music and were called Tyrannosaurus Rex. They were instantly successful on the British underground music circuit. Their first album, bearing the cumbersome title My People Were Fair And Had Sky In Their Hair...But Now They're Content To Wear Stars On Their Brows, was released in 1968. That title is a good indication of Bolan's mentality. He wrote childlike and nonsensical lyrics, which sometimes consisted of chants and other strange noises. But he had an uncanny ability to draw you into his bizarre Tolkien-like universe with his dreamy music. He had a unique voice that alternately sounded innocent and evil, and which evoked an otherworldly feeling that few people could achieve. My People Were Fair... was a striking debut. Although it now pales next to the albums that came later, it offers a good introduction to Bolan's highly individual visions. The closing track, "Frowning Atahuallpa", contains spoken-word poetry read by British underground DJ John Peel; for whatever reason, that same song contains a Hare Krishna chant. 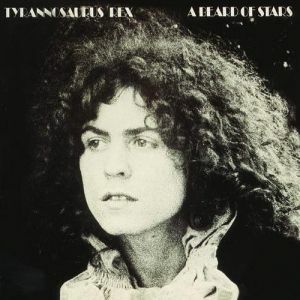 Like most T. Rex albums, this one was produced by Tony Visconti, and all of the songs were written by Bolan. The second album, Prophets, Seers & Sages - The Angels Of The Ages, was released only a few months later. It basically offered more of the same supernatural fairy tale folk music, but it was slightly better; the song structures were becoming more varied. Bolan's aggressive weirdness still abounds. The opening track is titled "Deboraarobed" because it begins as a song about someone named Debora, but the second half of the song is played backwards! All gimmickry aside, Prophets... is another dreamy and unique recording. Note: In 1972, both of the first two albums were issued as a single two-record set by A&M Records called Tyrannosaurus Rex (A Beginning) (A&M SP 3514). This set is also out of print. 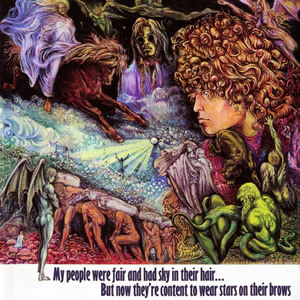 The third album, 1969's Unicorn, showed that Bolan was improving as he went along. The lyrics were still loaded with mythological creatures and visions, but the music was more refined. The sound was still acoustic, but more instruments were added to the mix, and producer Tony Visconti was adding more layers of sound. The songs were becoming hummable at times, and some (including "The Seal Of Seasons" and "Catblack (the wizard's hat)") were downright pretty. But there is no shortage of quirkiness on Unicorn, which according to the back cover is "dedicated to the three friends of Hiawatha". The closing track, "Romany Soup", mainly consists of a spoken-word children's story read by John Peel, with the added gimmick of having his voice alternate between speakers. This was Took's last album with Bolan; personal and creative tensions between the two finally took their toll, and the duo split. Took died in 1980 from choking while under the influence of drugs. 8. Like a White Star, tangled and far, Tulip that's what you are. At the urging of Tony Visconti and others, the duo then shortened its name to T. Rex. The self-titled album released in late 1970 is not as impressive as A Beard Of Stars, nor as fun as the landmark 1971 album Electric Warrior, but it is a logical bridge between the two. The first seven tracks sound similar to those of the last two albums, with a bit more electricity; "The Visit" and "Diamond Meadows" are the best of these. But on "Beltane Walk", Bolan and Finn begin to sound like T. Rex as we know them. The second half of the album provided further hints of what was to come. "One Inch Rock" and "Suneye" would fit in well on a later T. Rex album. If you want to hear Bolan play with his most reckless abandon, he goes over the top on "The Wizard". For whatever reason, the less-than-one-minute "Children Of Rarn" opens and closes the album. T. Rex completed Bolan's transition from acoustic cult figure to electric glam rocker. Soon after the album's release, the duo added a bassist and a drummer and recorded Electric Warrior, and the rest, as they say, is history. 1974 saw the first appearance of The Beginning Of Doves, an album of 20 demo-quality songs (most of them running well under 3 minutes) which, according to the liner notes, were recorded by Bolan before he met Steve Took and formed Tyrannosaurus Rex. Most of the songs are played acoustically. Bolan was alone on eleven of the tracks (marked with a single asterisk below). No other musicians are credited, but eight of the tracks (marked with a double asterisk) are known to have been recorded by Bolan and Steve Took, so some tracks were recorded later than the liner notes would suggest. On the first track, "Jasper C. Debussy", Bolan was backed by a four-piece band featuring veteran session players (pianist Nicky Hopkins, drummer Clem Cattini, guitarist Big John Sullivan) and Led Zep bassist-to-be John Paul Jones. Some of the songs are in the vein of the first five T. Rex albums; in fact, some were reworked on those albums. But most of the tracks are straightforward folk and blues tunes about people who could be real instead of mythical. There is nothing great here, but Bolan's unmistakable voice distinguishes the material, and adds the necessary innocence to some songs and necessary evil to others. (Notes: Beginning Of Doves has come in many forms. Alternate titles include Archive Series, Hard On Love, Love And Death, and Prehistoric. The first ten tracks were released separately as Observations, while tracks 11-20 were separately released as Misty Mist. Several of these tracks were released on Cat Black and You Scare Me To Death, with added electric backing tracks recorded by hired studio musicians. Beginning Of Doves was reissued on CD in England by the Castle label in 2002 -- with seventeen additional tracks! This review applies only to the track listing below). In the '80's and '90's, numerous Bolan and T. Rex discs were posthumously released in England by the Official Marc Bolan Fan Club. Many of these records are reviled by purists, but at least two of them that were released during the early '80's are worth checking out if you come across them. Billy Super Duper and Dance In The Midnight both consist mainly of re-mixes of songs Bolan recorded after his glam-rock heyday had passed. These records were produced by John and Shan Bramley, who owned the fan club at the time. Many of these songs later turned up in rawer form on the Unchained CDs. The 1982 record Billy Super Duper was pressed in red vinyl, and contained a dozen touched-up tracks that were mostly recorded between 1975 and 1977. The only exception is "Buick MacKane and the Babe Shadow", which was recorded in 1972 and sounds like a Tanx outtake. That is the only track which features the classic Bolan-Finn lineup; T. Rex comes in many forms on the other tracks. This album has often been misidentified as the intended follow-up to Bolan's swan song Dandy In The Underworld, and the 1977-recorded tracks could well have been part of that. In any case, Billy Super Duper is an intriguing mixed bag. The title track and "Depth Charge" are pseudo-disco numbers that would have fit in well on the Futuristic Dragon album. The most memorable songs are "Love Drunk", "Mellow Love" (served up with 1982-recorded strings), and "Shy Boy". Those are three pop songs that make Bolan sound both sleazy and romantic. The 1983 release Dance In The Midnight only gave billing to Bolan, and was packaged in a double-gatefold sleeve. No dates are given for the recordings, but most sources indicate that the songs were recorded between 1972 and 1976. These songs are mixed in such a way that they often sound like traditional pop and rock songs, albeit with Bolan's unique voice distinguishing the material as always. The Bramleys were apparently attempting to update the sound, and Dance In The Midnight resembles a solo album that Bolan could have recorded if he were alive in 1983. "Fast Blues (Easy Action)", an alternative version of "Solid Gold Easy Action", is one of the high points. "Brain Police" inserts Bolan into new wave territory. "Down Home Lady" features Bolan singing at the top of his range. And, yes, "Stand By Me" is a Ben E. King cover. The Peel Sessions EP is a limited edition CD consisting of four live-in-the-studio songs recorded by Bolan and Finn on October 27th, 1970 for broadcast on The John Peel Show on BBC Radio One. First broadcast on November 7th of that year, the sessions include a performance of "Ride A White Swan", which was the breakthrough single for T. Rex in England. That distinction aside, it's not one of Bolan's best songs, and the performance of it here is nothing special. However, the other three songs are well-done: "Jewel" and "Suneye" (both from the T. Rex album) sound very good, and "Elemental Child" (from A Beard Of Stars) is awesome. That track alone makes the EP worthwhile, showing Bolan at the top of his game. A better live recording of Bolan and Finn was BBC Radio 1 Live In Concert, recorded at London's Paris Theatre on January 4th, 1970. This 29-minute CD, released in 1993, finds the duo (before their name was shortened) performing songs mostly from A Beard Of Stars, which was not yet released at that point. "Debora" is the live version of "Deboraarobed" from the second album, obviously without the record-played-backwards gimmick. The duo succeed remarkably well at performing these songs in this setting. As always, "Elemental Child" is a high point. As usual, "The Wizard" is somewhat overbearing.